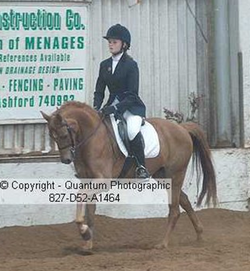 This was my first time representing the West Street Pony Club in a Team Competition. It was a very dauniting experience but we all thoroughly enjoyed it! I was riding Tammy and as she always did she jumped two fantastic clears. 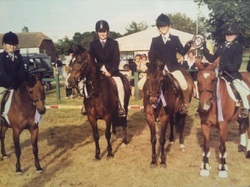 After 5 years of consistant placings in the team competition at Hickstead, it was our last year in the under 12 Mini Class and we HAD to win it!! We all jumped double clears and were drawn 2nd to last to go in the jump off. We had watched everyone else do it and there was only one turn that nobody else had done, so I was chosen to do the Jump Off and as you can see we WON! 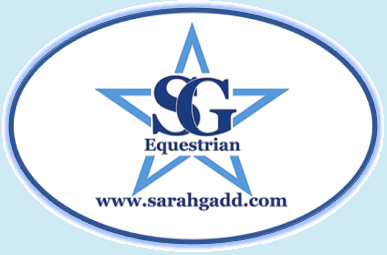 I was chosen to represent the South East of England in a Mini-Major Pairs Relay Competition held at the Olympia Horse Show, London. 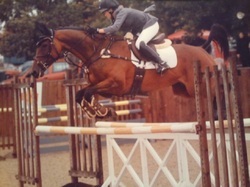 I was paired with Jean Paul Nicolau, a French International Show Jumper. I had such a fantastic day, and Tammy jumped very well in her trial run but then when we went in for the actual competition she was stunned to see al the people watching, but she jumped another fantastic clear but unfortunately she didn't go quite as fast as she normally did as she spent more of her time looking at everyone watching!! We Royal Windsor Park and we went to look at our course....it was HUGE!! 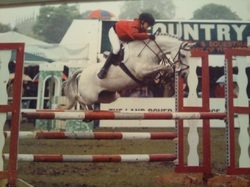 Our mums had decided not to tell us how big it was until we got there, and from a 13.1hh pony 1m10cm looks MASSIVE!!! But this was a fantastic day; we got help warming our ponies up from International Show Jumpers including Robert Whitaker and Tim Stockdale. 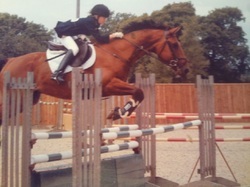 We set of for Wales and I was terribly excited, albeit slightly nervous, as this was my second show on Sox!! I settled her in to her stable and went to have a look around with Laura. 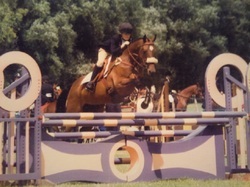 Laura Geary came with as she had qualified for the smaller classes riding Tammy Girl. On the first day we were 5th in the morning class and then 2nd in the afternoon class so I was soooooooo pleased. On day 2 we came 1st in both the morning class and the afternoon class and we started to build up our fan club which followed me around and wathched all of mine and Sox's rounds, cheering every time i jumped a clear which was fantastic. On day 3 we won both classes again qualifying for the final the next day much to our fans clubs excitement! On the final day we jumped 2 beautiful clear rounds in the main ring and did a fantastic jump but unfortunately we were beaten by a 13.2 showjumping pony that managed a turn that no one else managed. We still came home Reserve Champion with lots of rosettes and a lovely rug too (which i still have today.....even if it is a bit small for mine!!). This year we felt slightly more prepared, for starters we knew how big it was going to be! I have to admit the fences looked a more jumpable size from a horse that's for sure. Sox started of very well, jumping everything very big up until fence 8. This was the last triple coming down towards the gate but to get the right line to this i had to go past a shop on the outskirts of the ring that was selling umbrellas!! There were loads of Umbrellas undone and out on show and Sox flatly refused to go near any of them! So i had to retire her. This was a brilliant day, and lovely weather too! Sox did her usual jumping 2 beatuiful lear rounds as did the other members of the team leaving us on a score of 0 to go into the jump off and we ended up second, which we were all pleased with as we were clearly the youngest team in the Open class! 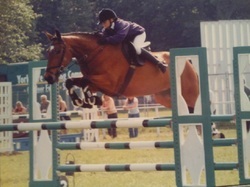 This Show Jumping Qualifier was held at Felbridge in 2005 and we al jumped very well. Sox had one fence down in the first round but then jumped a brilliant clear in the second round leaving our team on 4 faults. We then all jumped off, as did the other teams on 4 faults but luckily we were the fastestnd finished 4th. 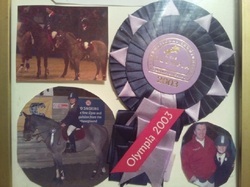 We were pleased but annoyeed at the same time as only the first 3 teams qualified for the Pony Club Championships. 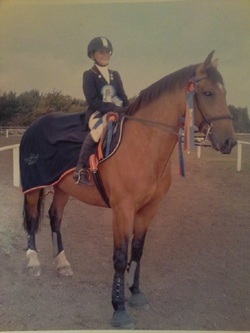 With sox I had done everything in the Pony Club and reached the highest level we would together so I had a slight change and concentrated on Dressage with Sox whilst I was getting to know Maybe IV to event her. Sox did a lovely warm up test and came 2nd in that so I was quietly excited about doing the more advanced test! She went very well but we did loose marks for her walk as she got a little but tense and jogged, still we were all pleased finishing 5th. This was only my second event on Maybe IV so I was slightly nervous, and going round your first BE Novice track is always daunting isn't it?!? Let alone doing it on your second event. 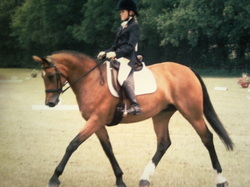 Maybe did an ok Dressage, she added in her own little flying changes but the judge did say ''Well tried''. We had two poles down in the Show Jumping which wasn't too bad considering the ground was ridiculously wet and there was not a single clear round! Cross Country she went like a machine, clear inside the time, so i was chuffed to bits! Arko was owned by my neighbour, and I had started riding him at home as she had decided to sell him and wanted me to compete him for her. 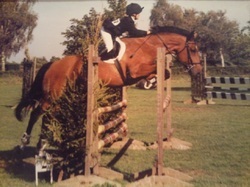 He was full up 17.2hh so at with me only 15 years old I looked quite small on him! He managed to throw me of in the warm up, which made me more determined to go clear infront of everyone in the main ring. We did, we jumped two beautiful clear rounds which gained quite a bit of interest in him. 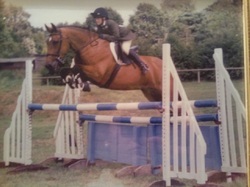 One of Maybe's last competitions before she did her Tendon injuries. She jumped very well, giving our team two clear rounds leaving us on a team total of 0 so we had it all to play for in the Jump Off. Unfortunately we came 3rd, just missing out on a Team Qualification for the Pony Club Championships...AGAIN!! I have to admit that we were more excited about the second placing we had got in the Tack and Turn Out Competition. This was almost asking a bit too much of Roxie as it was by far the biggest she had ever jumped with me but she went very nicely jumping clear in the first round and only having four faults in the second round, so my mum and I were very happy with how she was progressing and figured we must be doing something right! This was a fantastic experience, one that I will never forget! We left home on the Tuesday and after a very long journey arrived at Nottingham Race Course where we were stabling our horse before going to Draycott House the next day for the competition. On arrival we took them all for a nice long hack around the race track to stretch their legs. The next day Tango went incredibly well. 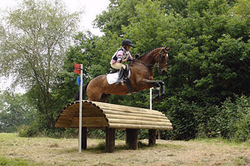 He scored 67.3% putting him in 8th place in our arena out of 49 Pony Club competitiors from across the UK. Here was when his next owners came to try him, they watched me do my Dressage test on him and were amazed by how much he shows off when he knows every one else is watching him, trotting round flicking his pretty little toes all over the place.